The Swiss holiday resort town is most famous for its mineral springs, majestic alps and world class ski trails. But it's equally easy to see why visitors also look forward to savouring a myriad of delicious dining places. When you have a celebrated name like chef Reto Mathis behind a restaurant, you'd expect the food to be good; he is after all the chef behind the world famous La Marmite atop the Swiss alps. And, yes, there is much to savour. The extensive menu has a strong focus on regional specialities, made with locally-sourced ingredients where possible. There is quite a range to look forward to, but fans will be glad to know that his signature truffle pizza and seafood carousel are mainstays. In true St. Moritz fashion, you’ll enjoy these in a grand and elegant room that overlooks the stunning landscape. This country club is worth a stopover, thanks to its storied past as the event base during two Winter Olympics. After undergoing a major renovation last year, it now houses a warm and homey European restaurant helmed by executive chef Mauro Taufer. He’s known for utilising seasonal, homegrown produce to create contemporary dishes showcasing his global influences. Think dishes like a refreshing pairing of watermelon and heirloom tomatoes with burrata cheese; or roasted wild salmon lathered with piquant chimichurri; and roasted lamb with a side of sautéed seasonal mushrooms, young potatoes and green sauce. Walk off the meal by taking in the beautiful surrounds fronted by an ice rink and a tennis court. The restaurant, which is open only during winter, has always been a choice destination of the rich and famous (including silverscreen icons like the late Elizabeth Taylor). It’s nestled within the well-maintained Badrutt’s Palace Hotel, a heritage building that used to be a farm house. You’ll be drawn to its rustic Alpine charm complemented by wooden furnishings and vintage cutlery. The interiors serve as the sumptuous background to the delectable, meat-focused menu; the skilled culinary team uses customed oven to expertly grill lamb, deer and beef. But, hands-down, the crowd favourite is the roasted and extremely juicy Bresse chicken infused with rosemary. Make advance reservations if you plan to dine here during ski season. This 40-seat restaurant, with its bright and cheery atmosphere, gets booked up fast. The affable husband-wife duo Kathrin and Danijel Krasnic take care of the restaurant's front of house, while chef Luca Porro helms the kitchen. The focus here is amazing local produce, which he whips up into simple yet flavoursome fare. 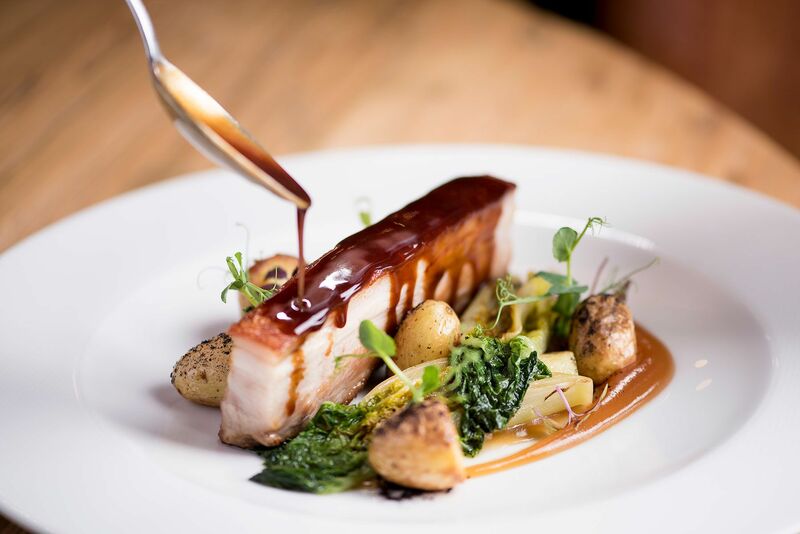 Such are the plump ravioli with veal shank stuffing, parmesan and herbs garnish, as well as the pork belly with a crackling crisp skin and bathed in a vibrant pea puree. Its award-winning wine list comprising 7,500 bottles deserves a mention; it spans the Bordeaux and Burgundy regions, as well as Switzerland, Germany and Italy. Chocolate-coloured walls, plush furniture and sleek, futuristic lamps, this unambiguously trendy restaurant is owned by Allegra Gucci of the Gucci family. For a lazy afternoon, plonk yourself on the comfortable sofa and take your time with some freshly baked croissants and pastries, and Italian espresso exclusively blended for the restaurant. Stay for dinner for a taste of its famous ossobuco con polenta, pasta dishes and pizzas, as well as inventive cocktails and bubbly—all while being serenaded with live music.